Victoria-based mobile data company Tutela released its March 2019 ‘State of Mobile Networks’ report for Canada, which reveals some surprising details about Canadian telecom services and confirms some things we already know. Right off the bat, the report notes that Canadians pay the “highest price in the developed world for their LTE data.” While that might not be a surprise to most, the report goes on to say that Canadians benefit from “reliable, high-speed” coast-to-coast coverage. Tutela’s report focuses primarily on the consistency and quality of each carrier’s networks. One of the metrics used to determine the quality is download speed, but the report stresses that high speed isn’t the be all and end all. The quality measures also consider upload speed, latency, jitter and packet loss when assessing quality. What does it mean to have consistent quality? Tutela developed a ‘consistent quality standard’ it uses to measure the carriers. According to Tutela, networks that have an average download speed at or above 4Mbps, upload speed at or above 2Mbps, latency at or above 50ms, jitter at or above 30ms and around zero percent packet loss fall into the Excellent pocket. Excellent networks are sufficient for the most demanding use cases, according to the company. That means users can reliably stream 1080p video, perform video calls and more. Tutela says basic is enough for simple web browsing, emails and VOIP calling. However, users who try to do more will likely experience delays and buffering. You can learn more about how Tutela measures network quality here. Tutela applied its standards to Canadian telecoms’ 4G and 3G networks to determine which offered the most consistent quality. The company started with the Big Three: Rogers, Bell and Telus. 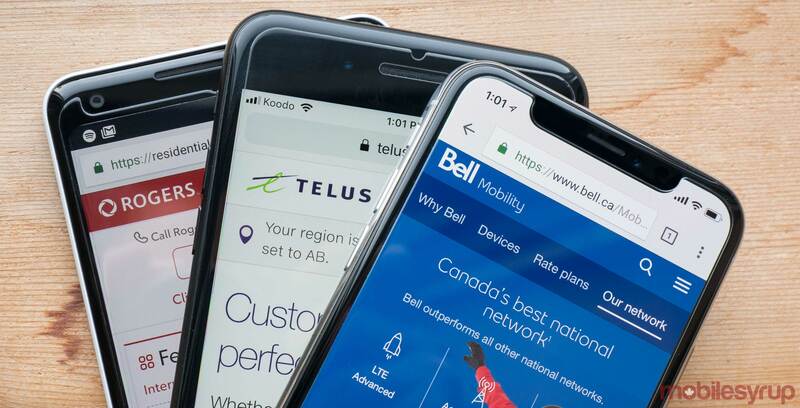 According to the report, Bell and Telus had a virtual tie in network quality despite Bell’s superior download and upload speeds. Tests of Telus’ network fell into the Excellent category 84.9 percent of the time compared to Bell’s 84.4 percent. 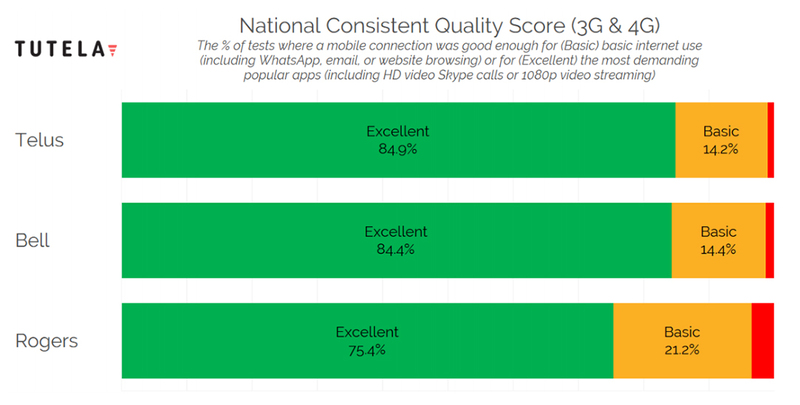 Across Canada, Rogers’ Excellent consistent quality score was nine percent lower than the other two. In about a quarter of tests, Rogers’ network did not meet Tutela’s standard for Excellent consistent quality. Tutela also compared the provinces to see which telecoms had the best quality in different geographic areas. B.C., Alberta, Ontario, Quebec and New Brunswick all saw at least two providers tied for quality. Rogers had the best network quality in Saskatchewan, Bell in Nova Scotia and P.E.I. and Telus in Manitoba and Newfoundland and Labrador. Additionally, Tutela’s data shows that every province except Manitoba has a network quality rating of 80 percent or higher. Manitoba measures in at 74 percent. Tutela’s report did not measure data from the territories. As for download speeds, Bell clocked in with an average 27.1Mbps average on its 3G and 4G networks, making it the fastest. Telus was second with an average download speed of 23.3Mbps. Rogers came third with 14.8Mbps download speed. Upload speeds saw a similar pattern, but the gap was much closer. Bell saw an average of 11.4Mbps on its 3G and 4G networks, Telus saw 11Mbps and Rogers had 9.8Mbps. Tutela also measured network latency across the Big Three. Telus scored the best here with 36.8ms average latency compared to Bell’s 37.7ms and Rogers’ 46.9ms latency. The report also measured the performance of the Big Three’s flanker brands. Bell owns Virgin Mobile and Lucky Mobile, Telus owns Koodo and Public Mobile and Rogers owns Fido and Chatr. 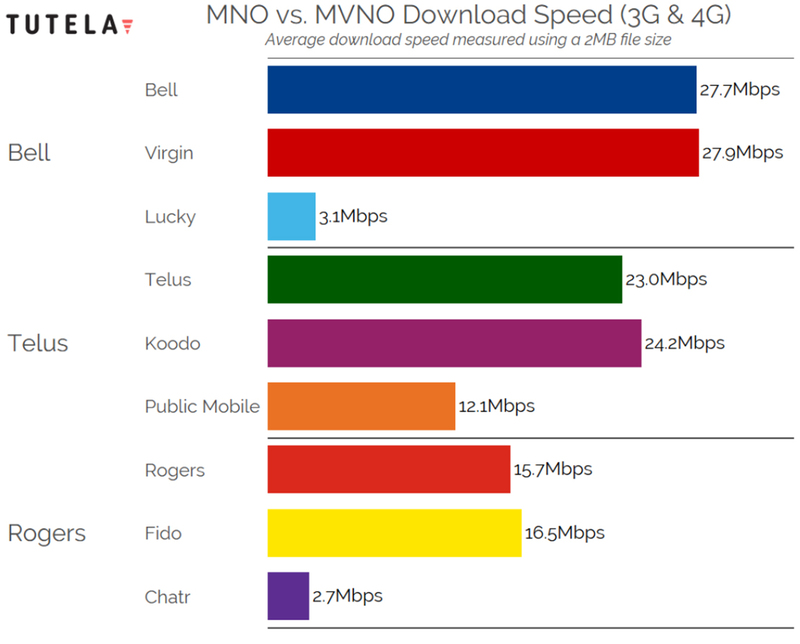 According to the report, Virgin, Koodo and Fido all offer nearly identical or better download speeds than their parent carriers. 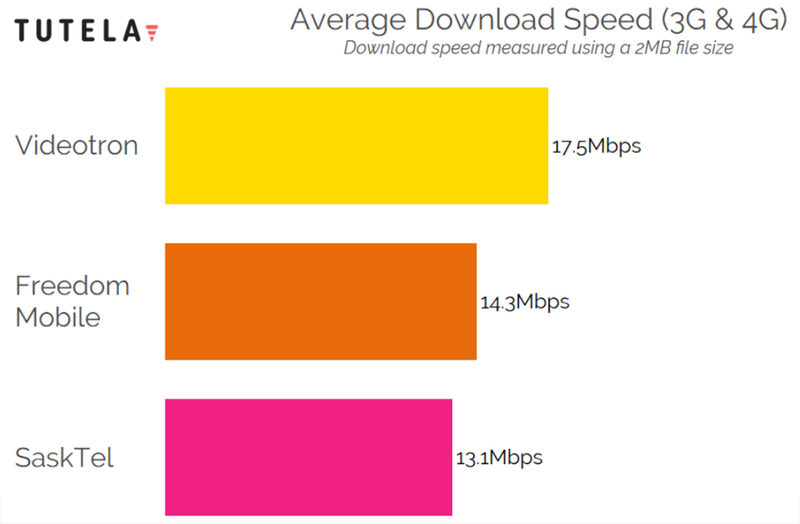 Public, Lucky and Chatr all offer significantly worse download speeds — although it’s worth noting that Public is still about 9Mbps faster than Chatr and Lucky. Tutela says the reason why Virgin, Koodo and Fido saw slightly higher download speeds than the Big Three is because of demographic differences. The subscribers to these flanker brands are more likely to live in urban areas, where download speeds are higher on average. As for Lucky, Public and Chatr, Tutela notes that all three predominantly offer plans restricted to 3G data in exchange for reduced monthly costs. The company says 3G caps out at 3Mbps download speed, which isn’t high enough to qualify for the Excellent consistent quality standard. Tutela measured the quality of regional telecom operators Videotron, Freedom and SaskTel as well. These carriers offer a cheaper alternative to the Big Three but are restricted to specific regions. Users can ‘roam’ on the national carriers when they leave the coverage region, but with limits. All three cover major urban areas in their regions. Videotron covers a large portion of southern Quebec around Ottawa and up the Saint Lawrence River. SaskTel covers most of the bottom half of Saskatchewan and Freedom has service in large metro areas like Toronto, Vancouver and Edmonton. Tutela found the regional operators typically kept pace in terms of speed and coverage quality. Videotron measured an Excellent consistent quality rating of 87.4 percent. SaskTel came in at 81.4 percent and Freedom at 72.9 percent. Videotron also topped the charts for average download speed at 17.5Mbps across its 3G and 4G networks, followed by Freedom at 14.3Mbps and SaskTel at 13.1Mbps. Tutela measures network data through more than 3,000 popular iOS and Android apps and games. The company pays those apps and games to host the software. Users with these apps are asked if they want to allow Tutela to perform tests. Tutela performs download and upload speed tests if a users consents, typically with a smaller 2MB files for downloads and 1MB for uploads. Tutela says this kind of testing more accurately represents a network’s speed as it measures several small downloads and uploads over time. 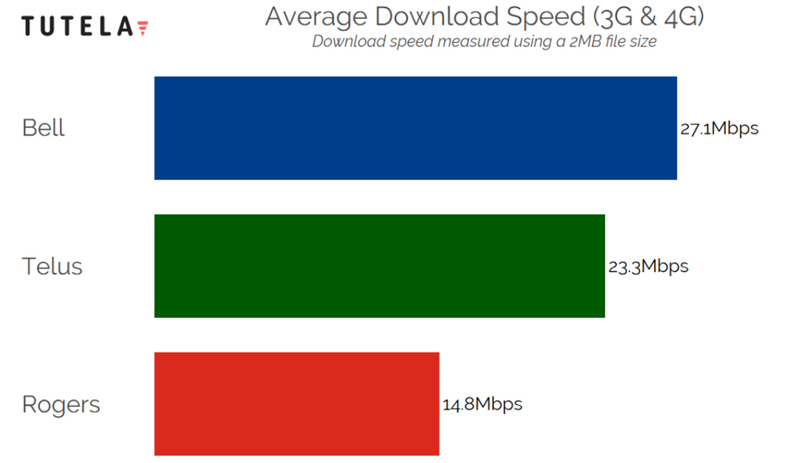 This directly contrasts other speed measurements like Speedtest and Ookla, which use a single, larger download file for testing. To learn more about Tutela’s data measurement, check out this MobileSyrup article, which features an in-depth explainer from the company about its process. You can read Tutela’s State of Mobile Networks report for yourself here.